Story by Shannon Wianecki. Photos by Sue Hudelson. In the early days of the twentieth century, a quintet of Hawai‘i’s most powerful business interests—known as the Big Five—dominated the political and commercial landscape of the Islands. In their shadow, small family-run businesses sprang up, lending color to local communities. Independent entrepreneurs supplied their neighbors with life’s necessities—fuel, ﬁshing gear and funnel cakes—and things less tangible: a sense of place, continuity and character. They still do. Family albums: Kamaka `Ukulele and Guitar Works on O`ahu began during the time of World War I and is still going strong: S. Tokunaga Store in Hilo is still reeling them in, too. This is the tale of ﬁve ma-and-pa businesses in Hawai‘i that are small but mighty. They survived the Great Depression, multiple wars, tsunamis, hurricanes, ﬁres and—perhaps most challenging of all—the transition from one generation to the next. Still solvent, still in the family, each venture emerged out of the dream of running your own business—and survived thanks to a great deal of hard work. Over the past hundred years, these humble operations evolved into beloved Island institutions, hubs around which their communities revolve. A stroll through Hasegawa General Store reveals what’s important to the residents of Hāna, the isolated village in the farthest corner of East Maui. The island’s largest selection of machetes hangs above the ofﬁce window: everything from grass whackers to coconut splitters. The display is a shrine to the single most useful tool in this rainforested terrain, where Hasegawa’s has operated for the past 110 years. Beyond machetes, the store is ﬁlled with hammers and nails, fresh avocados and lettuce, Hula brand chow fun noodles, movies to rent and items to make one blush: pregnancy tests and lice shampoo. Tourists seeking sustenance for the long drive back to their hotels can also stock up on souvenir tees and bumper stickers. When brothers Soichi and Saburo Hasegawa opened the store in 1905, Hāna’s sugar plantations supported a population of three thousand, almost triple the number of residents living here today. People and goods arrived by interisland steamship. The serpentine Hāna Highway wasn’t built until 1926—and then it was a mere gravel track that took three and a half nerve-rattling hours to drive. Soichi’s son Toshimasa Hasegawa inherited the store in 1932, followed by his son Harry in 1961. Harry, who is now a youthful 80 years old, remembers watching the freight ship pull into the pier loaded with goods for his parents’ shop. In those days the Big Five did all of the merchandising—and monopolized most of the customers. “Being a non-plantation store, we just took the leftovers,” says Harry. To entice shoppers to their side of the street, the Hasegawas offered homemade ice cream and another rarity: electricity. The plantations that provided power for the community shut down at night; that’s when the Hasegawas’ diesel generator snapped on, drawing people into the store after sundown. With the onset of WWII, the Hasegawas welcomed Hāna’s ﬁrst tourists: American GIs. Soldiers had money to spend and no allegiance to the sugar company stores. Then, in 1946, Hāna’s last sugar mill closed. Many residents moved. But the Hasegawas stayed put. Toshimasa was a hobbyist photographer; his black-and-white photos show the store crammed with inventory from ﬂoor to ceiling: bolts of fabric, engine belts, teakettles and toys. Most purchases were made on credit; the Hasegawas carried customers until payday each month. When Harry reached college age, Toshimasa told him, “You’re going away to school but you have to come back.” Harry did, and later sent his own eldest son, Neil, off with the same instruction. 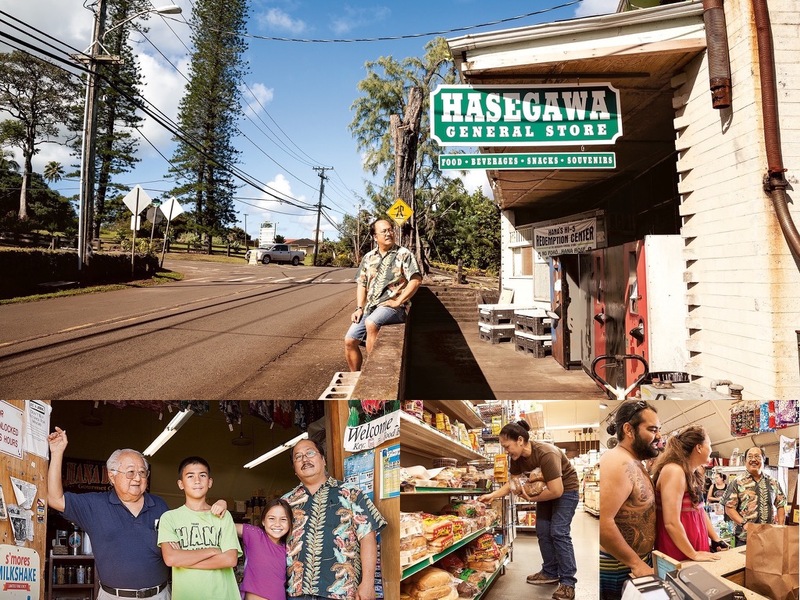 By that time Hasegawa General Store was famous; composer Paul Weston immortalized the mercantile’s jampacked shelves and warm aloha in song. Proprietor Neil Hasegawa (in aloha shirt) stands with his children and father Harry in front of the store's new home. Neil relocated the store and rehabilitated the business after a fire claimed the original structure in 1990. Continuing the family business was a given for Neil Hasegawa. He loved living in Hāna, where he could ﬁsh and pick ‘opihi (limpets) in the same coves as his great-grandfather had, and he recognized every other car. But his faith in small-town values was tested shortly after he returned from college. Before dawn on August 14, 1990, the Hasegawas woke to bad news: Their store was ablaze. “From the stop sign you could see the halo glow of the ﬁre,” remembers Neil. Hāna didn’t have a ﬁre station then, just one ﬁreﬁghter with a small pump truck. The store and the old family home were reduced to ashes. Investigators determined it was arson. “That was a shock,” says Neil. “I took it personally.” He looked at people differently, wondering who was responsible. “It was a dark time,” he says. “Finally, I had to let it go.” The family relocated what little they were able to salvage to the vacant Hāna Theater across the street. “We didn’t lay anyone off through that whole ordeal,” says Neil. “We all stayed together. That was healing in a way.” The store’s dozen employees helped renovate the theater. By February they were back in business. The Hasegawas not only reopened, they expanded their services, and the store now serves as many as ﬁve hundred customers a day. Its bulletin board is a conduit for local communication. Neil installed the town’s ﬁrst ATM. He negotiated with UPS to accept deliveries for customers who live beyond drivers’ routes and installed a HI-5 redemption center so residents no longer have to haul recyclables out of town. Neil and Harry also have plans to rebuild at the original site. The new store will cater to community desires: a deli with locally caught ﬁsh, a bigger beer selection and possibly an even more lavish shrine to the machete. The first Kamaka to lend the family name to the ‘ukulele was Sam Kaiali‘ili‘i Kamaka, who started the uke-making company in 1916. Today his descendants continue his celebrated legacy. Above, Sam's two sons Fred (left) and Sam Jr., flanked by the next generation: (left to right) Chris Sr., Fred Jr. and Chris Jr.
It’s no secret that family businesses rely on unpaid labor. The children of entrepreneurs pitch in from the time they can hold tools. And retirement? That’s for people who don’t have ledgers to balance or employees who call in sick. But family-operated workplaces are uniquely social environments; hours are spent laboring side by side with the people most dear. At 90, Fred Kamaka still clocks in four days a week at his family’s ‘ukulele factory in Kaka‘ako on O‘ahu. Fred started working at age four, alongside his elder brother Sam Kamaka Jr. Each afternoon, the boys went straight from the school bus to their father’s workshop, where they glued bridges, backs and fretboards onto ‘ukulele. Nowadays, Fred’s primary chore is giving tours of the family business. The smartly dressed senior has no trouble shouting over the factory’s sanders, vacuums and saws. The scent of cut wood permeates the high-ceilinged warehouse, and a silky ﬁlm of sawdust blankets every surface. At the end of the production line, shiny ‘ukulele await their owners: gorgeous wooden instruments that gleam as if lit from within. The double K logo tucked between the tuning pegs commands respect throughout the music world—and fetches a hefty price. Kamaka ‘ukulele start at $895 apiece. Fred’s tours begin with a brief history of the iconic Hawaiian instrument—a tale interwoven with his own family history. The ‘ukulele’s invention dates back to the 1880s, when Portuguese immigrants brought several small guitars to Hawai‘i. A few tweaks to the strings and the uke was born. Native Hawaiians, notably King Kalākaua, embraced the instrument. Fred’s father, Samuel Kaiali‘ili‘i Kamaka, numbered among the early adopters. The young Hawaiian apprenticed under Manuel Nunes (one of three luthiers credited with inventing the ‘ukulele) before shipping off for adventure. Using the ‘ukulele as his ticket, he traveled for ﬁve years across the United States, Europe and Africa. When Samuel returned to O‘ahu, he set about making his own instruments. He built his ﬁrst ‘ukulele out of construction scraps but soon switched to koa—a lustrous and resonant Hawaiian wood. In 1916, in the basement of his Kaimukī home, he opened Kamaka ‘Ukulele and Guitar Works. It was a fortuitous move; an ‘ukulele craze swept North America during the Roaring Twenties. Inexpensive and fun to play, the uke became the era’s most popular musical instrument. To meet demand, manufacturers popped up in Hawai‘i and on the Mainland. Samuel’s superior crafts-manship earned him a solid piece of the market. He further carved out his niche with a patented design: an oval-shaped ‘ukulele painted to look like a pineapple. Then the Great Depression hit. Kama-ka’s orders plummeted. Samuel’s handmade instruments sold for just ﬁve dollars, mostly to customers overseas. “If it wasn’t for my father selling ukes to Japan, we would’ve closed up shop,” says Fred. By 1940 Kamaka was the only Hawaiian ‘ukulele maker still in business. After Fred and Sam Jr. graduated from high school, dad sat them down and made them company partners—or, as Fred puts it, “tricked us into signing papers.” But Uncle Sam took priority. The brothers were drafted to ﬁght in WWII and afterward used the GI Bill to attend university. In 1953 their dying father called them home. Sam Jr. abandoned his studies to take over the business. Without the beneﬁt of his father’s expertise, Sam Jr. struggled to ﬁnd solid employees, especially skilled craftsmen. His wife, an occupational therapist, suggested giving disabled workers a try. Sam Jr. hired a few hearing-impaired woodworkers and discovered that their heightened sense of touch was a tremendous asset. They could “feel” the sound—accurately measuring the thickness of the wood through vibration alone. One such employee, George Morita, built Kamaka ‘ukuleles from age 18 to 62—nearly as long as Sam Jr. and Fred. Fred rejoined his brother at the factory in 1972. For the next three decades, he handled the ofﬁce while Sam Jr. managed manufacturing. Slowly their sons have taken their places. Fred’s son is the business manager, while Sam Jr.’s sons supervise production and special orders. Casey Kamaka—Sam Jr.’s middle son—might have the best schedule of the bunch. He followed his dream to become a pilot and now spends mornings ﬂying interisland for Hawaiian Airlines and afternoons tinkering with custom ‘ukulele, adorning them with mother-of-pearl inlays and ebony fretboards. 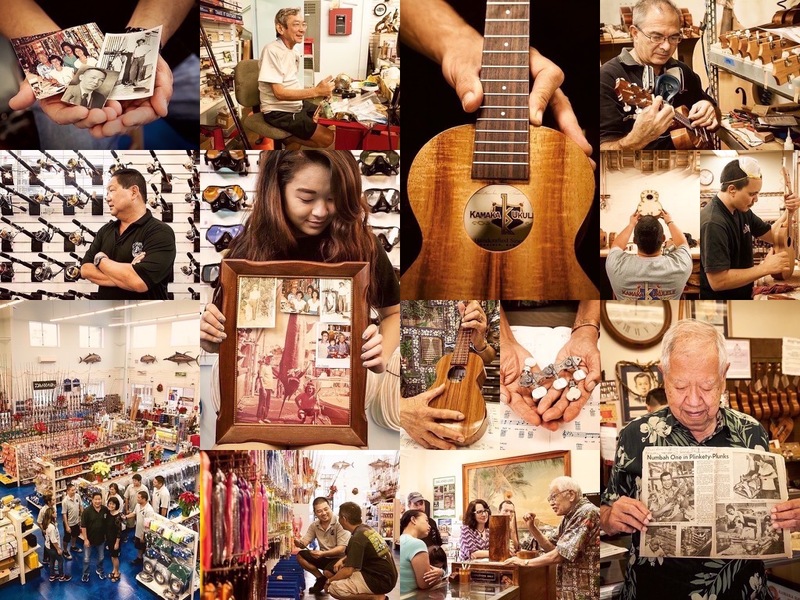 The company handcrafts four thousand ‘ukulele per year—every one spoken for. The instruments become treasured family heirlooms, credited with sparking more than one musician’s career. ‘Ukulele virtuoso Jake Shimabukuro, who exclusively plays Kamakas, is known to have said that Casey puts his heart and soul into them. Other celebrity fans have included George Harrison, Eddie Vedder and Auntie Genoa Keawe. “In Hawai‘i music is so important,” says Casey. Keeping his family’s legacy alive ﬁlls him with pride. For their contributions to music history, Sam Kamaka Sr. and his two sons were each inducted into the ‘Ukulele Hall of Fame. Hilo's Michael Tokunaga stands in front of a wall of reels, one of the many fishing and hunting related displays in his family's 95-year-old S. Tokunaga Store. Sumie Tokunaga was 19 when he emigrated from Japan to East Hawai‘i in 1908. He worked on a sugar plantation for twelve years before opening a market on Kamehameha, the busy avenue fronting Hilo Bay. He was a soft-spoken man who, from shore, could hook a ﬁsh that was nearly as long as he was tall. He ﬁlled his shop with the poles and lures his friends liked best. One day the sea itself paid a visit. On April Fools’ Day 1946, a massive wall of water thundered into town. An earthquake in the distant Aleutian Islands generated a tsunami that yanked Hilo’s bayfront buildings from their foundations, tossed a locomotive into the river and wrapped the railroad’s steel tracks around a coconut tree. When the waves receded, much of downtown was demolished—including Sumie’s store. At least he was alive; 159 people perished. Opened by Sumire Tokunaga in 1920, the S. Tokunaga Store has supplied generations of Hilo's fishermen with quality gear and good advice. Many business owners lost everything and gave up. Sumie persevered, re-establishing his shop a block inland on Mamo Street. Over the next fourteen years, he saw his children marry and his ﬁshing tackle business prosper. But the sea wasn’t ﬁnished exacting its toll. In 1960 another tsunami slammed into Hilo. This one claimed sixty-one lives and once again demolished the S. Tokunaga Store. It was terrible timing: Sumie had hoped to retire that year, but none of his three children wanted to take the helm. Enter Ethel Tokunaga, Sumie’s daughter-in-law, who did want the job. She knew how to catch ﬁsh from following Sumie down to the shoreline. She knew how to run a business from a prior job at a candy shop. She adored ﬁshing and felt at home among Hilo’s divers, boaters and ﬁsherfolk. So after the family rebuilt S. Tokunaga Store for the second time, Ethel became the boss. At Tokunaga’s third location on Keawe Street, she expanded the inventory. She stayed open late on Friday nights to reel in moviegoers headed to Palace Theater and nearby restaurants. Her son, Michael Tokunaga, was four years old when she took over. He remembers hanging around with kids from the neighboring businesses. “We’d go ﬁshing together or to the movies after our chores,” he says. Michael Tokunaga's wife Peggy with a photo of Sumi. Michael assumed ownership in 1991 with the support of his wife, Peggy. Last April they moved the store to Manono Street, its ﬁfth location—and farthest from the waterfront. The bright, spacious warehouse is a ﬁsherman’s dream come true. Michael painted the concrete ﬂoor the color of the sea; it turns deeper blue as shoppers progress from reef ﬁshing gear to equipment for catching pelagics. A ﬂuorescent rainbow of lures ﬁlls an entire wall. There are over ﬁve hundred rods to choose from, as well as spearguns, hydroﬂasks, headlights and fancy silicone masks. The back of the store, painted camouﬂage, is devoted to hunting supplies. Each June Tokunaga Store hosts the largest ﬁshing tournament in the state. Nearly six hundred competitors cast off from Hawai‘i Island during the three-day Ulua Challenge. The event—now in its twelfth year—promotes sustainable ﬁshing practices, such as ﬁsh tagging and the use of barbless hooks. The Tokunagas’ progressive thinking has earned them multiple honors over the years. But for Peggy, the greatest reward is overhearing customers call the store their own. “I love it when they take ownership,” she says. The pickup trucks cruising through Hilo show a deﬁnite bias; every other one sports an S. Tokunaga Store sticker. At the Tip Top Cafe and Bakery, Owen Ota and his son Jonathan carry on a tradition that their ancestor Denjiro started in the early twentieth century: serving the people of Kaua‘i simple fare in large quantities. Businesses that stand the test of time become cherished landmarks, especially on an island that’s twice been wiped clean by hurricanes. In downtown Līhu‘e, Kaua‘i, the retro cinderblock building that houses the Tip Top Motel, Cafe and Bakery hasn’t changed much over the past ﬁve decades, and that’s how the loyal clientele likes it. Fourth-generation owner Jonathan Ota says that even swapping out the vintage light ﬁxtures hanging above the dining room might spark a revolt. When Jonathan’s great-grandfather, Denjiro Ota, opened Tip Top in 1916, it was the ﬁrst café in town. The manager of the Lihue Store had wanted a breakfast place so badly he talked Denjiro into creating one and lent him the necessary funds. It was named for its ﬁrst location, the two-story Tip Top building at the main intersection in town. When Denjiro passed away twenty years later, his son took over. Mitchell Ota expanded the bakery and created his famous from-scratch pancakes. In 1965 he moved the business a half-mile away to its current spot and added a thirty-four-room motel. “People told him he was crazy,” says Mitchell’s grandson Jonathan. Tourism had yet to take hold on Kaua‘i; but the investment soon proved sound. Business travelers and families seeking to avoid long drives late at night capitalized on the cheap accommodations. Back then the bakery accounted for a much bigger part of the business. An enormous oven covered over 180 square feet; its twelve rotating racks could accommodate 432 pies—or 144 turkeys—at a time. Two days before Thanksgiving, Kaua‘i families dropped off items destined for the oven—not just turkeys, but chickens, ducks and whole pigs. They retrieved their bounty on Thanksgiving morning, along with chiffon cakes and apples pies. The memories of bygone holidays aren’t so sweet for the Otas. “Thanksgiving was a terrible day for us,” says Jonathan. “Our family would wake at 4:30 a.m. to roast turkeys. By noon we were exhausted.” Jonathan’s father, Owen Ota, didn’t relish grappling with the greasy birds that required turning every hour. “We didn’t charge enough, that’s for sure,” he laughs. Pictured here circa 1946, the Tip Top Cafe and Bakery was Līhu‘e's first restaurant when it opened in 1916. Owen and Jonathan both grew up working at Tip Top but pursued independent careers. When Mitchell died in 1989—after ﬁfty-three years of running the business—Jonathan left his accounting job on O‘ahu. “I didn’t want to come back,” he says, “but I had an obligation. I wanted to honor my grandfather. Two years after he assumed ownership, Hurricane ‘Iniki hit. Jonathan, his father, mother and a few employees huddled in Tip Top’s kitchen while the storm razed the island. The concrete building was sturdier than most in town but still sustained nearly $1 million in damage. Savage winds ripped off the bakery’s roof and dumped salt water and debris onto the antique oven. For better or worse, the relic couldn’t be repaired. In the storm’s aftermath, the Otas fed employees and the military out of Tip Top’s storehouse. They reopened within ﬁve months and have been going strong ever since. From skating bears and steam-powered merry-go-rounds to the massive neon carnival rides of today, Fernandez Entertainment has been providing amusements to the Islands for over a hundred years. Of all the youngsters raised in the family business, the Fernandez kids had the best chores: parading around as clowns, selling cotton candy and bottle-feeding baby chimps. The circus runs in this family’s blood. By age 14, Scott Fernandez was an elephant trainer who assembled tiger cages and had a soft spot for acrobats—much like his grandfather. Scott’s grandfather Edwin K. Fernandez was born in 1883 to a Hawaiian woman of royal lineage. King Kalākaua bestowed little E.K. with his middle name, Kaneikawaiola, and threw a week-long lū‘au in celebration of the boy’s ﬁrst birthday. As a teen, E.K. and his parents accompanied Queen Lili‘uokalani on a trip to Washington DC to protest annexation. E.K. left the entourage in Utah, where he attended college. Scott Fernandez is following in the footsteps of his grandfather E.K. Fernandez, who was known as the "Barnum of the Pacific." In 1903 the intrepid Hawaiian returned home with a mystifying new contraption: a motion picture camera. He ﬁlmed Island scenes by day and screened them at night on sheets strung up in plantation camps. E.K. traveled to San Francisco to screen his ﬁlms at the 1915 World’s Fair. He arrived there a ﬁlmmaker and returned a ring-master. He brought a four-hundred-pound skating bear back with him to Hawai‘i, along with ﬁve other animals and twenty performers. That year he produced Hawai‘i’s ﬁrst circus in Honolulu’s ‘A‘ala Park. The following year, at the Maui County Fair, he debuted the Islands’ ﬁrst amusement ride: a steam-powered merry-go-round. Over the ensuing years, E.K. brought the best acts in the business to the Islands: wild-animal trainer Clyde Beatty, the Flying Wallendas and the clown Emmett Kelly. Fans called him the “Barnum of the Paciﬁc.” He introduced Hawai‘i to its ﬁrst rodeo, ice show and elephants. He visited each island in turn and then shipped his carnivals to extended tours in Asia. One of E.K.’s acts stole his own heart. In 1927 he booked the Nearing sisters—the world’s youngest high-wire artists to perform without pole or parasol. After he met ﬁfteen-year-old Rose, he extended their three-week contract to a year. The lovely acrobat was less than half his age, but that didn’t stop E.K. from wooing her after she returned to California. Ultimately the showman won her love. She sailed back to Hawai‘i on the Lurline. E.K. met her boat with Hawaiian musicians, hula dancers and heaps of lei, and they married that day. “Wherever E.K. and Rose went, it was an event with pomp and circumstance,” says Scott. His grandfather wore snappy white suits and hats adorned with pīkake ﬂowers while his grandmother modeled the latest fashions from Europe. birth to a son, Kane Fernandez, who shared his father’s ﬂair for showmanship. When E.K. died in 1970, Kane succeeded him as the “Carnival King.” He inherited an empire and a lot of work. Twelve-hour workdays—for weeks on end—are the norm. Success is never guaranteed. Rain-outs are devastating. But the carnival biz is one of few in Hawai‘i that doesn’t rely on tourists. And even when the economy tanks, people still take their kids to the fair. Today, Fernandez Entertainment has its stamp on outdoor and indoor recreation across Hawai‘i. When Kane died in 2001, his son Scott stepped up as CEO of the carnival operations. His mom, Linda, runs Fun Factory, the spinoff arcade business. Memorial Day signals the start of the 50th State Fair, the largest of the company’s twelve annual events. Over six summer weekends, some 150,000 people stream through the gates eager to win a stuffed unicorn, snack on funnel cakes and scream as the Zipper whips them upside down.